Manisha Koirala said: "I can't afford to make wrong moves at this stage"
Manisha Koirala is not going to make any mistakes, personally or professionally, now that "God's given her a second chance. The 47-year-old cancer survivor told news agency IANS that she is willing to accept that she's not "destined" for love rather than getting into a "wrong relationship again." Manisha Koirala was married to businessman Samrat Dahal from 2010 to 2012. She told IANS: "Maybe the man-woman love is not destined to happen for me. Fine. I'd rather accept this sad truth of my life rather than fall into the wrong relationship again. I won't allow any man to bring me down, ever. Whether it is my career or my personal life, I can't afford to make wrong moves at this stage when God has given me a second chance." Last year it was reported that Manisha Koirala wanted to adopt a baby girl. Speaking of adoption, Manisha said that adoption is on the cards "but not right away. Not when I am so busy. I will bring home that child only when I know I can give or him all my time. There is no point in becoming a mother when your other duties in life pull you away in other directions." Manisha Koirala is currently awaiting the release of Sanju, in which she plays the role of Nargis Dutt, mother of actor Sanjay Dutt (played by Ranbir Kapoor onscreen). Manisha trended for days after her character poster released in which she bore striking resemblance to the late actress. Nargis lost the battle to cancer in 1981, days before the release of Sanjay Dutt's debut film Rocky. But looking like Nargis wasn't half the job done for Manisha. She explained: "I've tried to capture her essence, the core of her being. Just looking like her, or combing my hair the way she did, is not enough. I had to understand her spirit, her soul. Just how much I've succeeded, we will soon know." Speaking about revisiting her battle with cancer, which she finally beat in 2015, Manisha told IANS: "To live through the pain, trauma and suffering again... It required a lot of inner strength to play Nargisji. But finally it was all worth it, because Nargis was such an iconic figure." "My world fell apart (on learning I had cancer). But then the experience made me so much wiser and tolerant. It takes a life-threatening experience to make you realise the true value of life," she added. Manisha Koirala elaborated about her role in the Rajkumar Hirani-directed film and said: "This is new to me. I've always been a spontaneous actor. But for Sanju, I did a lot of research on Nargisji. The film focuses on Nargis the doting mother who wanted to protect her son from the truth about her health until his first film was released. Unfortunately, she passed away before her son debut film Rocky released. This really broke him." Of her 'brief role' in Sanju, Manisha said: "What I meant was, perhaps all the female actors have less to do than Ranbir Kapoor in Sanju. Ranbir Kapoor plays Sanjay Dutt and the film is about him. I wanted to work with director Rajkumar Hirani. I've been fortunate to work with some of the best filmmakers in the country - be it Sanjay Leela Bhansali (Khamoshi: The Musical), Mani Ratnam (Bombay and Dil Se), or Vidhu Vinod Chopra (1942: A Love Story), who is the producer of Sanju." 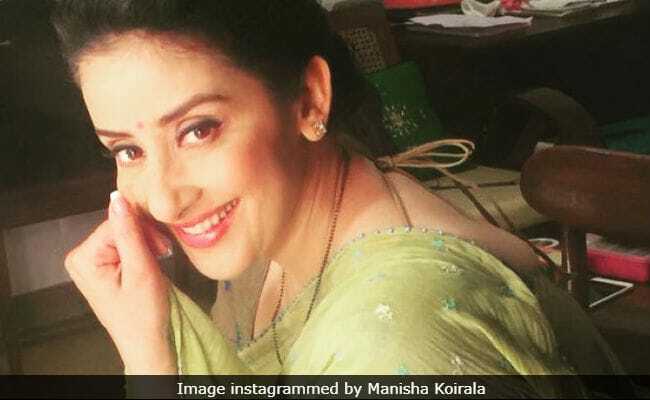 From playing the onscreen mother of the reel Sanjay Dutt to co-starring with the real Sanjay Dutt, it is all happening for Manisha Koirala simultaneously, Manisha Koirala has signed Prasthanam opposite her Yalgaar co-star. "Sanjay and I go back a long way. Like me, he too has gone through a lot in life," she said. Apart from films, Manisha Koirala is busy completing her memoir. "That is 80 per cent complete. I am co-authoring my experiences with a professional writer as I am not a professional writer. I needed someone to formulate and organise my thoughts. Hopefully, the book will motivate cancer survivors and those who feel they have reached the end of their world. Every end is a new beginning. Today I feel I am starting all over again in life."